News and crypto rates update from the past hours to keep you informed and up to date with the latest events that shape up the cryptocurrency world. 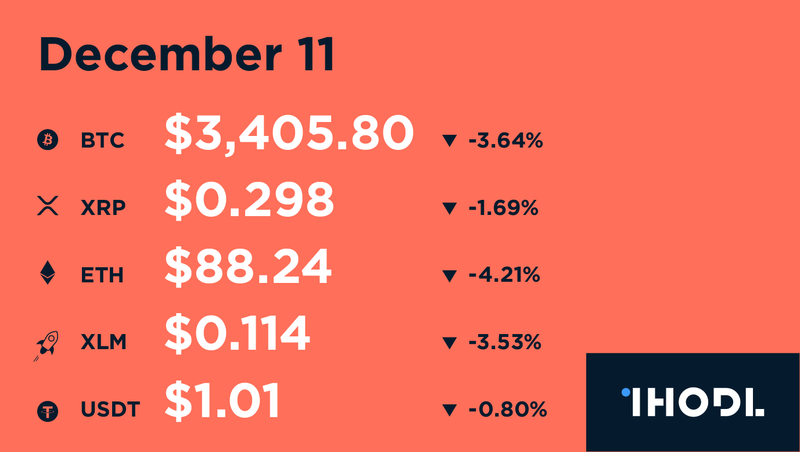 At 12:00 (GMT) total cryptocurrency market capitalization stands at $107.656 billion. Takeshi Fujimaki, a Japanese lawmaker, has proposed major changes to the current taxation system for cryptocurrencies in Japan — to revitalize the market, benefit crypto traders and broaden the adoption of cryptocurrencies in the country. UNICEF is investing in six blockchain projects in emerging markets to “solve global challenges using blockchain technology” — from healthcare delivery transparency to the management of finances and resources. Facebook has opened vacancies for blockchain developers. The social network is looking for a data scientist, a data engineer and two software engineers. Blockchain’s adoption by names like Facebook is always a positive milestone. Huobi has expanded its presence on the Russian market with a new regional crypto exchange — Huobi Russia. Despite the current bearish market, the trading volume of the exchange in the country is growing, according to its CEO. The United Kingdom seems to have very positive plans regarding the future of Bitcoin, the world’s leading cryptocurrency — namely its usage as a payment method for the local taxation system. The mining equipment manufacturer Comino has released a brand new comic book: “Comino Galaxy Adventure”. This isn’t just another story about goodness and evil — it’s about far beyond our world.